Product #60624 | SKU 30Q-2-TANORG | 0.0 (no ratings yet) Thanks for your rating! 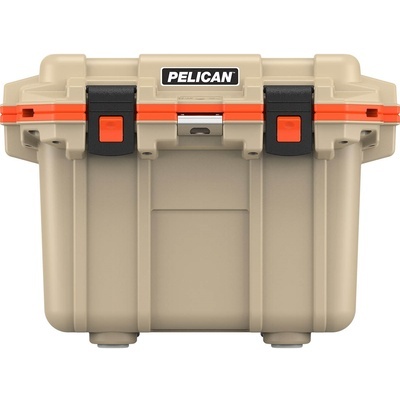 Pelican 30QT Elite Cooler preforms better than any cold locker, tougher than any icebox and was created to last a lifetime. Every part is engineered to meet extreme durability and performance standards. Including press and pull latches, freezer-grade seal, and the toughest handles in the business. 6 Days Ice Retention. Holds 20 Cans. EXTREME ICE RETENTION: World-class coldness holds ice for days. EMBOSSED FISH RULER: Measure your catch to scale. BUILT IN BOTTLE OPENER: The molded-in lock hasp keeps your contents secure and serves as a bottle opener. 30% LIGHTER WEIGHT: Proprietary technology reduces weight while maximizing strength and durability. PRESS & PULL LATCHES: Easy to use latches hold tight under pressure. MOLDED-IN HANDLES: Built in to make it easier to move. SMALL SIZE, BIG CHILL: Even with its convenient carrying size it still packs in 6 days of ice retention. DRAIN PLUG: Sloped floor & tethered plug threaded for standard garden hose. ERGONOMIC DESIGN: Thanks to the easy carry handle and grooved body, getting from point A to point B has never been easier on your hands or legs. MOLDED-IN CAN HOLDERS: Holds your beverage for safekeeping if you need to step away.